9.25" Optic Crystal Arch Award, World Globe Etched on smooth recess. Deep Blue Optical Crystal Combined With Optical Clear Crystal Back Drop. Etched Globe In A Concave Area on the Clear Crystal. The Global Fahrenheit Crystal Award has all the character of global presence, with it's etched globe and round base. 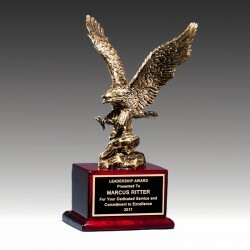 This corporate award is made of clear crystal and small red accents platform. This Glass Globe Award is mouth-blown and hand-cut glass, the globe is positioned beautifully upon a platform, providing plenty of room for your etching.